PostGIS 2.2 is due for release sometime in August of 2015. Among other things, PostGIS 2.2 adds some interesting 3D functions via SFCGAL. ST_Extrude in tandem with ST_AsX3D offers a simple way to view a census polygon map in 3D. With these functions built into PostGIS, queries returning x3d text are possible. x3d format is not directly visible in a browser, but it can be packaged into x3dom for use in any WebGL enabled browser. Packaging x3d into an x3dom container allows return of an .x3d mime type model/x3d+xml, for an x3dom inline content html. In this case I added a non-standard WMS service adapted to add a new kind of request, GetX3D. I’ll admit it’s fun, but novelty may not always be helpful. Adding elevation does show demographic values in finer detail than the coarse classification used by a thematic color range. This experiment did not delve into the bivariate world, but multiple value modelling is possible using color and elevation with perhaps less interpretive misgivings than a bivariate thematic color scheme. However, pondering the visionary, why should analysts be left out of the upcoming immersive world? If Occulus Rift, HoloLens, or Google Cardboard are part of our future, analysts will want to wander through population landscapes exploring avenues of millennials and valleys of the aged. My primitive experiments show only a bit of demographic landscape but eventually demographic terrain streams will be layer choices available to web users for exploration. Demographic landscapes like the census are still grounded, tethered to real objects. The towering polygon on the left recapitulates the geophysical apartment highrise, a looming block of 18-22 year olds reflect a military base. But models potentially float away from geophysical grounding. Facebook networks are less about physical location than network relation. Abstracted models of relationship are also subject to helpful visualization in 3D. Unfortunately we have only a paltry few dimensions to work with, ruling out value landscapes of higher dimensions. For some reason IE11 always reverts to software rendering instead of using the system’s GPU. Chrome provides hardware rendering with consequent smoother user experience. Obviously the level of GPU support available on the client directly correlates to maximum x3dom complexity and user experience. ERROR: WebGL version WebGL 0.94 lacks important WebGL/GLSL features needed for shadows, special vertex attribute types, etc.! In some cases the ST_Extrude result is rendered to odd surfaces with multiple artifacts. Here is an example with low population in eastern Colorado. Perhaps the extrusion surface breaks down due to tessellation issues on complex polygons with zero or near zero height. This warrants further experimentation. The performance complexity curve on a typical client is fairly low. It’s tricky to keep the model sizes small enough for acceptable performance. IE11 is especially vulnerable to collapse due to software rendering. In this experiment the x3d view is limited to the intersections with extents of the selected territory using turf.js. In addition making use of PostGIS ST_SimplifyPreserveTopology helps reduce polygon complexity. Xml formats like x3d tend to be verbose and newer lightweight frameworks prefer a json interchange. Json for WebGL is not officially standardized but there are a few resources available. PostGIS 2.2 SFCGAL functions offer a new window into data landscapes. X3d/x3dom is an easy way to leverage WebGL in the browser. Silverlight 5 Beta was released into the wild at MIX 11 a couple of weeks ago. This is a big step for mirror land. Among many new features is the long anticipated 3D capability. Silverlight 5 took the XNA route to 3D instead of the WPF 3D XAML route. XNA is closer to the GPU with the time tested graphics rendering pipeline familiar to Direct3D/OpenGL developers, but not so familiar to XAML developers. From a Silverlight XAML perspective, mirror land is largely a static machine with infrequent events triggered by users. In between events, the machine is silent. XAML’s retained mode graphics lacks a sense of time’s flow. In contrast, enter XNA through Alice’s DrawingSurface, and the machine whirs on and on. Users occasionally throw events into the machine and off it goes in a new direction, but there is no stopping. Frames are clicking by apace. Thus time enters mirror land in frames per second. Admittedly this is crude relative to our world. Time is measured out in the proximate range of 1/20th to 1/60th a second per frame. Nothing like the cusp of the moment here, and certainly no need for the nuance of Dedekind’s cut. Time may be chunky in mirror land, but with immediate mode XNA it does move, clicking through the present moment one frame at a time. Once Silverlight 5 is released there will be a continuous XNA API across Microsoft’s entire spectrum: Windows 7 desktops, Windows 7 phones, XBox game consoles, and now the browser. Silverlight 5 and WP7 implementations are a subset of the full XNA game framework available to desktop and XBox developers. Both SL5 and WP7 will soon have merged Silverlight XNA capabilities. For symmetry sake XBox should have Silverlight as apparently announced here. It would be nice for a web browsing XBox TV console. WP7 developers will need to wait until the future WP7 Mango release before merging XNA and Silverlight into a single app. It’s currently an either/or proposition for the mobile branch of XNA/SL. North of the border lies XML and recursive hierarchies, a largely language world populated with “semantics” and “ontologies.” South of the border lies a lush XNA jungle with drums throbbing in the night. Yes, there are tropical white sands by an azure sea, but the heart of darkness presses in on the mind. XAML touches the academic world. XNA intersects Hollywood. It strikes me as one of those outmoded Freudian landscapes so popular in the 50’s, the raw power of XNA boiling beneath XAML’s super-ego. I might also note there are bugs in paradise, but after all this is beta. Merging these two worlds causes a bit of schizophrenia. Above is Silverlight XAML with the beauty of recursive hierarchies and below is all XNA with its rendering pipeline plumbing. Alice steps into the DrawingSurface confronting a very different world indeed. No more recursive controls beyond this border. Halt! Only immediate mode allowed. The learning curve south of the border is not insignificant, but beauty awaits. XNA involves tessellated models, rendering pipelines, vertex shaders, pixel shaders, and a high level shading language, HLSL, accompanied by the usual linear algebra suspects. Anytime you run across register references you know this is getting closer to hardware. So now that we have XNA it’s time to take a spin. The best way to get started is to borrow from the experts. Aaron Oneal has been very kind to post some nice samples including a game engine called Babylon written by David Catuhe. The Silverlight 5 beta version of Babylon uses Silverlight to set some options and SL5 DrawingSurface to host scenes. Using mouse and arrow keys allows the camera/avatar to move through the virtual environment colliding with walls etc. For those wishing to get an idea of what XNA is all about this webcafe model in Babylon is a good start. The models are apparently produced in AutoCAD 3DS and are probably difficult to build. Perhaps 3D point clouds will someday help, but you can see the potential for navigable high risk complex facility modeling. This model has over 60,000 faces, but I can still walk through exploring the environment without any difficulty and all I’m using is an older NVidia motherboard GPU. Apparently, SL5 XNA can make a compelling interactive museum, refinery, nuclear facility, or WalMart browser. This is not a stitched pano or photosynth interior, but a full blown 3D model. You’ve gotta love that late afternoon shadow affect. Notice the camera is evidently held by a vampire. I checked carefully and it casts no shadow! From a mapping perspective the fun begins with this solar wind sample. It features all the necessary models, and shaders for earth, complete with terrain, multi altitude atmosphere clouds, and lighting. It also has examples of basic mouse and arrow key camera control. This is my starting point. Solar Wind illustrates generating a tessellated sphere model with applied textures for various layers. It even illustrates the use of a normal (bump) map for 3D effects on the surface without needing a tessellated surface terrain model. 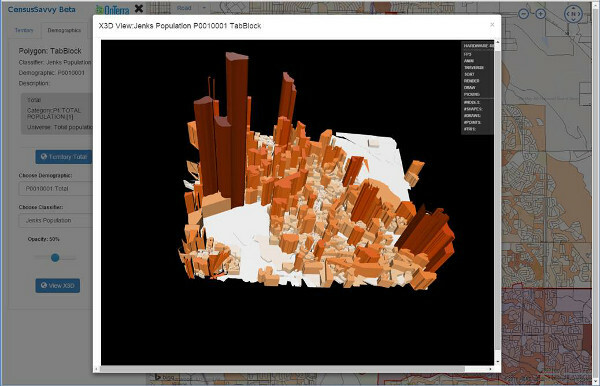 Especially interesting is the use of bump maps to show a population density image as 3D. My simple project is to extend this solar wind sample slightly by adding layers from NASA Neo. NASA Neo conveniently publishes 45 categories and 129 layers of a variety of global data collected on a regular basis. The first task is to read the Neo GetCapabilities XML and produce the TreeView control to manage such a wealth of data. The TreeView control comes from the Silverlight Toolkit project. Populating this is a matter of reading through the Layer elements of the returned XML and adding layers to a collection which is then bound to the tree view’s ItemsSource property. Once the tree is populated, OnSelectedItemChanged events provide the trigger for a GetMap request to NASA Neo returning a new png image. I wrote a proxy WCF service to grab the image and then write it to png even if the source is jpeg. It’s nice to have an alpha channel for some types of visualization. The difficulty for an XNA novice like myself is understanding the hlsl files and coming to terms with the rendering pipeline. Changing the source image for a Texture2D shader requires dropping the whole model, changing the image source, and finally reloading the scene model and pipeline once again. It sounds like an expensive operation but surprisingly this re-instantiation seems to take less time than receiving the GetMap request from the WMS service. In WPF it was always interesting to put a Video element over the scene model, but I doubt that will work here in XNA. The result is often a beautiful rendering of the earth displaying real satellite data at a global level. I need to revisit lighting which resides in the cloud shader hlsl. Since the original cloud model is not real cloud coverage, it is usually not an asset to NASA Neo data. I will need to replace the cloud pixel image with something benign to take advantage of the proper lighting setup for daytime. Next on the list is exploring collision. WPF 3D provided a convenient RayMeshGeometry3DHitTestResult. In XNA it seems getting a point on the earth to trigger a location event requires some manner of collision or Ray.Intersects(Plane). If that can be worked out the logical next step is grabbing DEM data from USGS for generating ground level terrain models. There is a lot of public LiDAR data out there as well. Thanks to companies like QCoherent, some of it is available as WMS/WFS. So next on the agenda is moving 3D LiDAR online. The bump map approach to displaying variable geographic density as relief is a useful concept. There ought to be lots of global epidemiology data that can be transformed to a color density map for display as a relief bump map. Lots of ideas, little time or money, but Silverlight 5 will make possible a lot of very interesting web apps. “I am real!” said Alice, and began to cry. Too bad it is only Linux/Unix since I’d prefer to attach to a Windows EC2. TIGER is there as raw data files ready to attach to your choice of Linux EC2. As is Census data galore. But why not look further? It’s interesting to think about other spatial data out in the Cloud. Jeffrey Johnson adds a comment to spatially adjusted about OSM with the question – what form a pg_dump or a pg database? This moves a little beyond raw Amazon public data sets. Would it be possible to provide an EBS volume with data already preloaded to PostGIS? A user could then attach the EBS ready to use. Adding a middle tier WMS/WFS like GeoServer or MapServer can tie together multiple PG sources, assuming you want to add other pg databases. Jeffrey mentions one caveat about the 5GB S3 limit. Does this mark the high end of a snapshot requiring modularized splitting of OSM data? Doesn’t sound like S3 will be much help in the long run if OSM continues expansion. What about OpenAerial? Got to have more room for OpenAerial and someday OpenTerrain(LiDAR)! EBS – volumes from 1 GB to 1 TB. Do you need the snapshot (only 5GB) to start a new EBS? Can this accommodate OpenAerial tiles, OpenLiDAR X3D GeoElevationGrid LOD. Of course we want mix and match deployment in the Cloud. Would it be posible for Amazon to just host the whole shebang? What do you think Werner? Put it out there as an example of an Auto Scaling, Elastic Load Balancing OSM, OpenAerial tile pyramids as CloudFront Cache, OpenTerrain X3D GeoElevationGrid LOD stacks. OSM servers are small potatoes in comparison. I don’t think Amazon wants to be the Open Source Google, but with Google and Microsoft pushing into the Cloud game maybe Amazon could push back a little in the map end. I can see GeoServer sitting in the middle of all this data delight handing out OSM to a tile client where it is stacked on OpenAerial, and draped onto OpenTerrain. Go Cloud, Go! This is aimed at creating a national building inventory rather than a terrain model, but still very interesting. The interior/exterior ‘as built’ aspect has some novelty to it. Again virtual and real worlds appear to be on a collision trajectory and may soon overlap in many interesting ways. How to make use of a vast BIM modeling infrastructure is an interesting question. The evolution of GE and VE moves inexorably toward a browser virtual mirror of the real world. Obviously it is useful to first responders such as fire and swat teams, but there may be some additional ramifications. Once this data is available will it be public? If so how could it be adapted to internet use? Digital Elevation Model data – The ability to supply custom DEM data, and have it automatically stitched into existing data. Terrain Scaling – This works now. Building Culling Value – Allows control of how many buildings are displayed, based on distance and size of the buildings. Turn on/off street level navigation – Can turn off some of the special effects that occur when right next to the ground. Both Google and Microsoft are furnishing modeling tools tied to their versions of virtual online worlds. 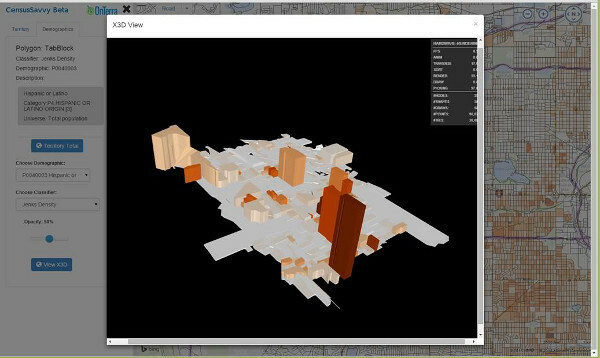 Virtual Earth 3dvia technology preview appears to be Microsoft’s answer to Google Sketchup. The race is on and shortly both will be views into a virtual world evolving along the lines of the gaming markets. But, outside of the big two, GE and VE, is there much hope of an Open Virtual World, OVM? Supposing this BIM data is available to the public is there likely to be an Open Street Map equivalent? Blender.org may be overkill for BIM, but is an amazing modeling tool and all open source. Certainly BIM models will find their way into browsers, but there needs to be a corresponding evolution of terrain modeling. BIM modeling is in the sub foot resolution while terrain is still in the multimeter resolution. I am hopeful that there will also be a national resource of LiDAR terrain data in the sub meter resolution, but this announcement has no indication of that possibility. I’m grappling with how to make use of the higher resolution in a web mapping app. GE doesn’t work well since you are only draping over their coarse terrain. Silverlight has no 3D yet. WPF could work for small areas like architectural site renderings, but it requires an xbap download similar to Java Web Start. X3D is interesting, but has no real browser presence. My ideal would be something like an X3D GeoElevationGrid LOD pyramid, which will not be available to browsers for some years yet. The new VE sdk release with its ability to add custom DEM looks very helpful. Of course 2D contours from LiDAR are a practical use in a web map environment until 3D makes more progress in the browser. Isenburg’s work on streaming meshes is a fascinating approach to reasonable time triangulation and contouring of LiDAR points. Here is an interesting kml of Mt St Helen’s contours built from LAS using Isenburg’s streaming methods outlined in this paper: Streaming Computation of Delaunay Triangulations. A national scale resource coming out of the “Stimulus” package for the US will obviously be absorbed into GE and VE terrain pyramids. But neither offers download access to the backing data, which is what the engineering world currently needs. What would be nice is a national coverage at some submeter resolution with the online tools to build selective areas with choice of projection, contour interval, tin, or raw point data. Besides, Architectural Engineering documents carry a legal burden that probably excludes them from online connectivity. Not small figures for an Open Source community resource. Perhaps OVM wouldn’t have to actually host the data at community expense, if the government is kind enough to provide WCS exposure, OVM would only need to be another node in the process chain. Further into the future, online virtual models of the real world appear helpful for robotic navigation. Having a mirrored model available short circuits the need to build a real time model in each autonomous robot. At some point a simple wireless connection provides all the information required for robot navigation in the real world with consequent simplification. This of course adds an unnerving twist to some of the old philosophical questions regarding perception. Does robotic perception based on a virtual model but disconnected from “the real” have something to say to the human experience? 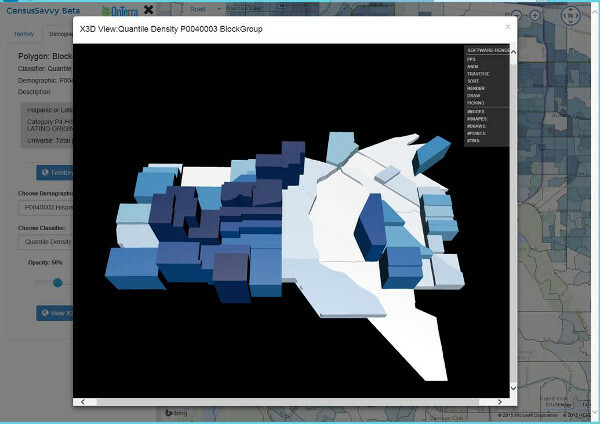 Fig 1 – XJ3D Viewer showing an x3d earth model. Well I confess, I’m no gamer! I’ve never handled a Wii or blown away monsters on a PS3. It doesn’t hold my interest that much. Guitar Hero makes me feel slightly nauseous. (When will they introduce Symphony Conductor for the Wii?) I suppose I’m an anachronism of the old paperback book era. My kids groan, but I can still get excited about the E.E. Smith Lensman series. However, I’m a bit chagrined to admit that I was oblivious to X3D until this past week. It’s just that gaming and GIS have not overlapped in my world yet. X3D has been around quite awhile. Some of the specs date back as far as 2003 and then there is the VRML97 ancestory so this is not new stuff. It reminds me a bit of the early SVG days, circa 2000. The novelty of event driven graphics in the browser was overpowering then, but it wasn’t until years later that Flash and Silverlight actually made xml graphics generally available to web app interfaces, almost ten years later. Now of course, SVG even has native support in most of the non microsoft browsers. I can imagine in the year 2018 that 3D graphics XML will be ubiquitous, but it will probably be some derivative of ChromeFlash, XNA, or WPF, while X3D may still languish in the outer reaches of civilization. X3D has a similar feel in that it’s a powerful anticipating specification with beautiful XML scene graph capability, but only a few implementations far from the mainstream. I won’t say I’m a sucker for XML, but I really, really like to look at a file and understand what it says. Nothing beats a good old text editor for playing with an XML graphics file. Sorry, my text bias is showing again. The Java3D API is a parallel enabling technology. The scene graph approach implemented in Java3D’s api enabled implementations of free X3D viewers. 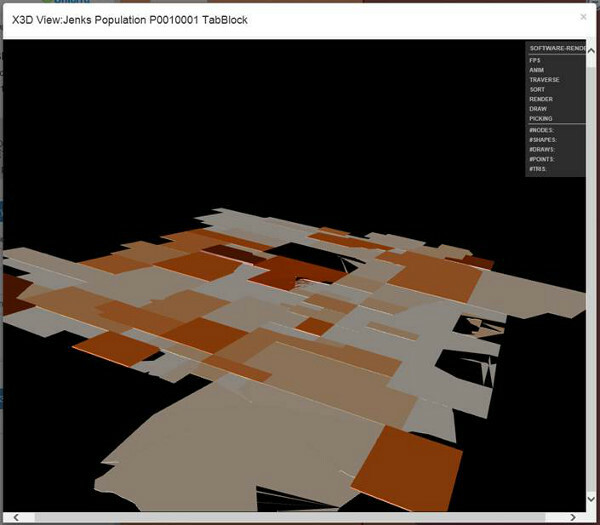 There are several viewers, but the one that actually worked on the geospatial component of X3D was Xj3D. In this case using version 3.2 of the X3D spec and a profile, “Immersive”. Profiles are used to break the X3D spec into smaller implementation areas. Consequently, with less effort, an implementor can meet a profile of the X3D spec suitable to the need instead of the entire “Full” specification. You can see a ‘GeoViewpoint’ element and a ‘GeoOrigin’ element in the small x3d listing above. The Immersive/Full profile is meant to imply a virtual world immersion experience. This means that a scene graph populates a world with context including lighting and a viewpoint that navigates through the virtual world space. Now this is of interest to a GIS developer in the sense that the virtual world space can mimic a real world space. X3D Earth provides some nice examples of using X3D with earth data. Not all of the examples are in working order using the latest build of XJ3D Browser. These are older samples and may not reflect the current configuration of the X3D specification. Another example of a virtual world space mimicing the actual world is Google’s Earth API. You can use a flying viewpoint to navigate through a model of the Rocky Mountains and get something like the experience of a bird or fighter jet. The mimicry is still coarse but the effect is recognizable. This is the horizon end point of mapping. The map abstraction eventually disappears into a one to one mathematical mapping with some subtle abstraction available as overlays and heads up displays. This is where the online mapping world eventually merges with the gaming world. Only for mapping, the imaginary part of the world is de-emphasized in favor of an immersive real world experience as an aid to navigating in external physical space. Thinking about these kinds of worlds and their overlaps has proven fascinating, as shown by the popularity of the Matrix movie series. Are we the Ghost in the Machine or the other way around? But that is best left to philosophy types. In the x3d snippet above you can see the GeoLOD that references down to level 6 of the terrain tile hierarchy. This is a recursive reference as each tile lower in the pyramid references the four tiles of the next level that make up the current tile, basically a quad tree approach found in most tile setups. The element attributes include a center, range, geosystem, and the ChildURL references. Inside the GeoLOD is a <Group> <Shape> element containing the current tile’s Appearance Material with a reference to the draping tile image and a GeoElevationGrid element with an array of elevations relative to the GeoOrigin. For this to work there are two pyramids, one containing the draping images and one with the x3d GeoTerrainGrids. The GeoTerrainGrid is the same as x3d ElevationGrid except it introduces the concept of a geospatial reference system. This is all very clever and useful, but it requires the Xj3D Browser viewer to play with it. In order to author this kind of world scene you also need tools to tile both the underlying terrain models as well as the overlaid imagery. Over in Microsoft I took a quick look at XNA Game Studio, which is the current development tool for XBox games. The XNA serializer supports a type of XML <XnaContent>, but there doesn’t seem to be much information about the XML XnaContent schema. I wasn’t able to find an X3D importer for XNA. Too bad, since an XNA importer would be another way to experiment with Terrain grids. As far as the future, it is easy to see that the WPF <MeshGeometry3D> can be used to perform the duties of a an ElevationGrid element. This means, at least in WPF, the basic building blocks are available to display and manipulate a scene in 3D. What is lacking is the concept of LOD, Level of Detail. After first seeing the DeepZoom MultiScaleImage element in action, I fell in love with the very natural navigation through its 2D space. It is not much of a stretch to see this being extended to a “MultiScaleMeshGeometry3D” element. Again WPF appears to be a look at the future of Silverlight, so it is not impossible to imagine this type of capability in browsers by 2018. In the non-Microsoft world X3D will play a role once implementations make their way into Chrome, FireFox, and Opera. In some form or other, XML scene graphs will be in the future of GIS, and yes, we will all be pro gamers!